"There was no question I asked Claire that she could not or would not answer"
As a SaaS calendar company, we have spent time with a variety of higher education marketing teams who are attempting to implement a new campus-wide calendar. From bootstrapped teams supported by a guy who 'took an HTML course in high school’ to marketing departments with an entire development/IT team behind them; we have seen it all. The idea of a campus-wide calendar implementation is pushed to the next project cycle. A Localist license is purchased and underutilized while the marketing team waits for IT resource availability. These less than ideal outcomes led us to the creation of Support Bold, a ‘hands-on’ approach in addition to our typical support protocol. 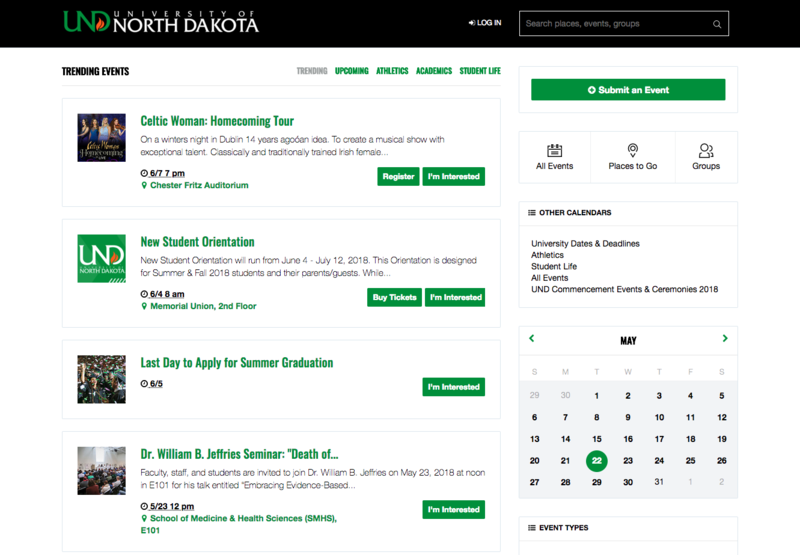 To get a better understanding of how Support Bold works, let’s take a look at the University Of North Dakota’s calendar implementation. First things first. 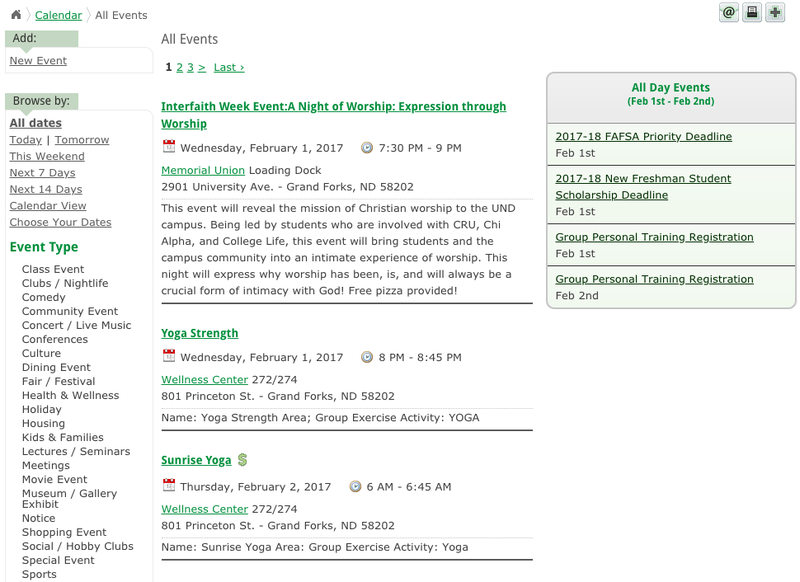 When The University of North Dakota decided to implement a new campus-wide calendar, why did they go with Localist? For a bit of a background, UND had been utilizing a 10-year-old homebuilt solution that they had outgrown. It was text heavy, lacked filters, not intuitive to use and difficult to maintain/update. Pictured below. During the time of the calendar evaluation, UND was also going through a website redesign with mStoner. Knowing that they needed a new calendar provider, UND and mStoner collectively decided to utilize Localist. A few of the main reasons being flexibility, scalability and the developer-friendly nature of the Localist platform. 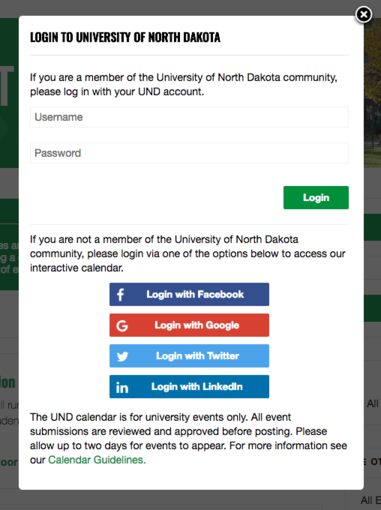 Given the scale of everything happening with the redesign and calendar implementation, IT (and marketing) resources at UND were stretched to the limit. UND has a highly capable team, but they had multiple irons in the fire. Given this fact, UND opted to include a Support Bold package with their license. The key piece of the Support Bold package is the Localist Implementation Specialist dedicated to the customer's account. The Localist Implementation Specialist is a technical member of our customer success/support team that can complete many of the tasks traditionally handled by an IT/development team within the scope of a calendar implementation. A few of the highlights are listed below. The UND marketing team had approximately one human to spare for the implementation of a fully branded, campus-wide calendar. Talk about a project. 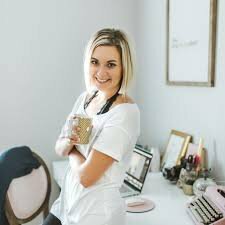 Layne Pfliiger, Social Media Manager from the Office of Marketing and Creative Services was the lucky lady in charge of the entire calendar project. Working alongside Layne was our very own Claire Gamino, an Implementation Specialist here at Localist. Given the scope of work that Support Bold covers, mStoner and the UND team were confident that this duo could handle the implementation of the campus-wide calendar. When it comes to software implementations, boring is good, right? At the end of the day, the calendar implementation went smoothly. Off the bat, Claire worked directly with the North Dakota IT team to implement the university’s single sign-on system so that students could log into the calendar with their university credentials. 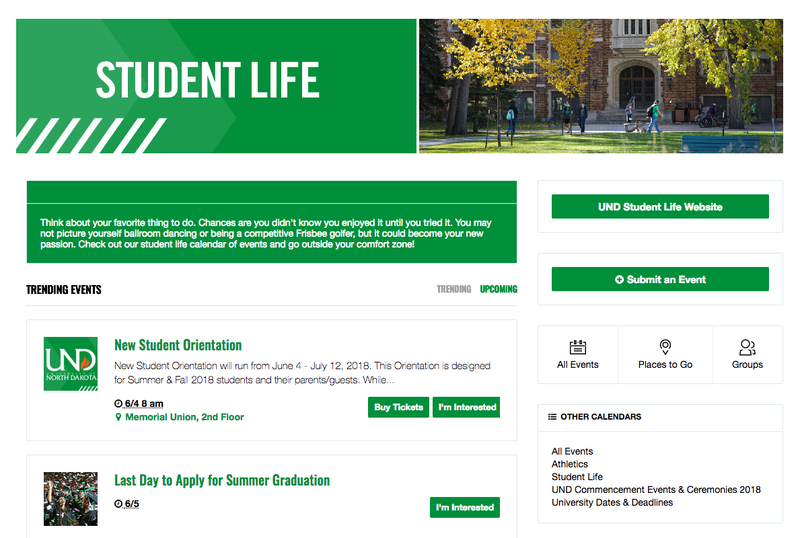 Layne and Claire also implemented social logins in order to engage the great UND community, outside of just the student, staff and faculty population. Given the fact that our support team is well versed in integrating single sign-on systems at other organizations, this process was expedited. Claire and Layne also used Localist channels to craft curated event pages for particular audiences on campus. Like every project, there were some road-blocks. The music department at UND had a very specific filtering system, that created multiple sub-calendars. Claire was able to work with Layne (institutional knowledge) to implement a technical solution (Localist knowledge) for the UND music department utilizing Localist widgets. There was also the ever present issue of working through institutional politics and ensuring everyone had their voices heard on the new calendar. Claire and Layne were able to combine powers to get everyone squared away. Layne told us that ‘Claire did everything’ but, what she really meant by that is Claire implemented everything. Without Layne’s guidance, our team wouldn’t know what features to implement and why. Claire, like our entire support team, is focused on best practices. We stray away from ‘yes/no’ answers and remain proactive with guidance throughout the implementation. This means that our team could take Layne’s concerns, offer solutions and then execute upon the chosen solution. This process was conducted multiple times throughout the implementation. As Layne jokingly told us, ‘Ask Claire how much I emailed her’. At the end of the day, Layne knows the internal dynamics at UND and our team is versed in implementing calendars at large institutions with a lot of moving pieces. It’s this combination of contextual knowledge and technical chops that allowed a campus-wide software implementation to unfold smoothly with little to no IT resources and a single marketing team member. If you want to see the UND calendar in action, you can find it below! Is a lack of IT resources holding you back?